Today I found out that some Tibetan monks can control the temperature of their skin through meditation. Specifically, they have been shown to be able to raise their skin temperature, measured from their toes and fingers, as much as 17 degrees Fahrenheit, while their core temperature stays normal. Scientists from Harvard University, lead by Herbert Benson, were first able to study these monks thanks to the Dalai Lama, who visited Harvard in 1979, and agreed to help them contact and convince the monks to allow them to be studied. What followed was a series of visits to remote monasteries in the Himalayan Mountains throughout the 1980s. 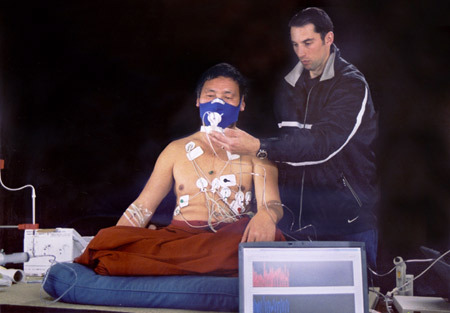 Not only did they discover the monks could raise their surface temperature while keeping their core temperature normal, but they also found a group in Sikkim, India that could lower their metabolism by 64 percent. For perspective on how remarkable this is, when you sleep your metabolism drops only 10-15 percent. The scientists also got a chance to document the monks spending a night out on a rocky ledge in the Himalayas. The monks were dressed in their simple wool robes with no extra insulation and slept on the cold rocks separated from one another. The altitude was 15,000 feet and the temperatures reached zero degrees Fahrenheit as they slept, apparently comfortably, through the night. With as little insulation as they were wearing and laying on the cold rock separated from one another, this should have killed the monks. But they were all fine and the cameras didn’t even catch them shivering at any point. When they woke, they walked calmly back to their monastery, not seeming to notice the cold at all, unlike the scientists and camera crew who were all bundled up and freezing by morning. “Dalai Lama”, not “Dali Lama”. In the science fiction novel _Wheelers_, by English mathematician Ian Stewart and reproductive biologist Jack Cohen, monks are the most powerful socioeconomic leaders in spacefaring human culture — for precisely the reasons cited above. Good book. *queue Space Monks? * So, make a line of them? Or are you trying to give them a cue? Seriously?!? Fahrenheit? Who uses that? Five countries in the WHOLE WORLD! If you’re going to use it, at least put the Celsius equivalent so the rest of us can understand! I found this article interested. I want to find the studies. Cause for as far back as I can remember, I have been able to raise the temperature in my hands. My wife enjoys it, cause I’m like a hot water bottle for her.